It is the end of day and time for sleep. My nightly ritual as I lay in bed is to say my prayers. As I expressed before in an earlier blog, most of my prayers are of gratitude. And those follow my prayers for peace. In between, I pray intercessory prayers for specific individuals. For the past fifteen months, since April 22, 2013, I have prayed for a father named Abraham. He is an important figure in that ancient church, a church that has schools and hospitals, and has a liturgy in a language that is similar to what Jesus spoke while he was here on earth. And after the war broke out in 2011, he was a voice for peace and reconciliation. His voice was silenced along with his Greek Orthodox colleague, Archbishop Boulos Yazigi, when they were kidnapped on that day in 2013, April 22. The story is they were negotiating the release of other hostages when they were taken themselves. There has been no evidence to this day that they are alive or dead. No remains found. No ransom demanded. Just silence. And so I pray nightly between my prayers for peace and my prayers of gratitude for their safe release. They are fathers of many and they are loved and missed. Their voices for peace and reconciliation are missed. Their example and their witness are missed. We were introduced to Msgr. Ibrahim that day by one of his clerical colleagues in Aleppo, another Ibrahim: Assis (Rev.) Ibrahim Nsier, the Presbyterian pastor of the church in Aleppo. Before meeting the archbishop, Assis Ibrahim introduced us to yet another colleague this one named Efrem, a Syriac Orthodox priest (Abuna Efrem) who served with the archbishop in Aleppo. One of my most endearing and enduring memories of that day is this photo of Assis Ibrahim and Abuna Efrem. They were having a conversation in Arabic together, smiling and laughing as they talked. I asked them what was so funny and they told me they were talking about the differences between different branches of our faiths. “It’s a language issue,” they said. “We split over things we don’t have the words to explain. 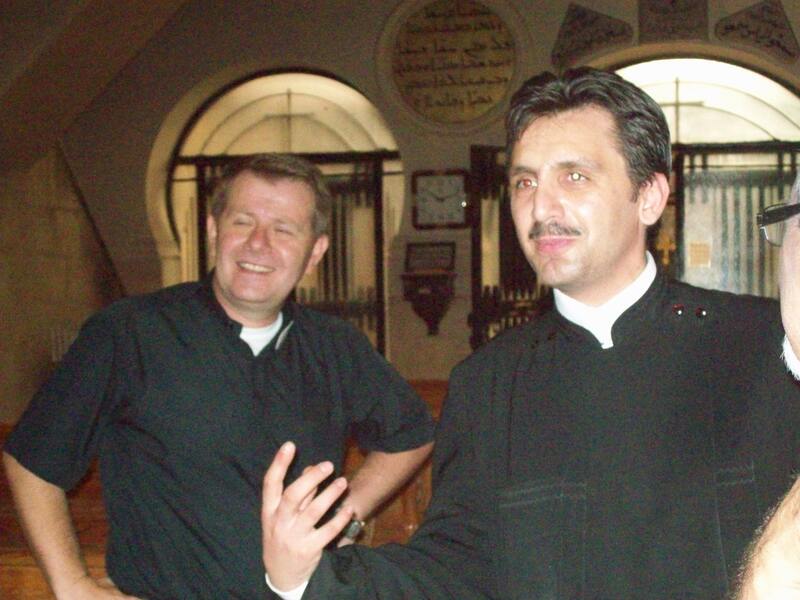 How do you find the words to explain the mystery of the divine and human natures of Christ in one being?” To this day, it strikes me that I went halfway around the world to see a pastor of our reformed faith having this amazing conversation with a priest of the ancient faith that began in the Middle East. This faith had traveled from one side of the world to the other, reforming and refining as it went, and it still exists in all these expresssions so many decades and centuries later…and we can talk together about it even if we understand it differently. There was peace; there was reconciliation; there was collegiality and conversation. It was the most marvelous picture of the church I have ever experienced. Abram was called out of his homeland by God and told his descendants would be more numerous than the stars in the sky. God changed his name to Abraham, father of many. 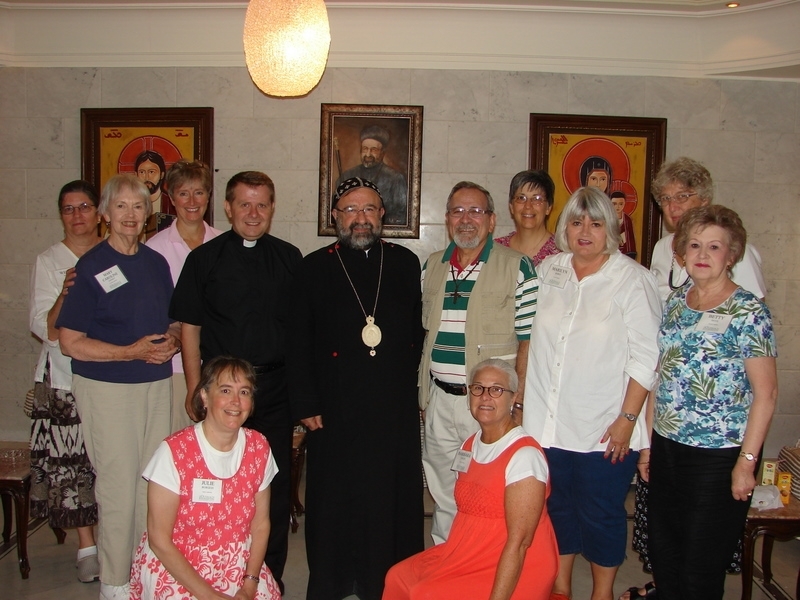 And tonight I am thinking of his decendants that I met in Aleppo and praying that those who call them Archbishop, Pastor, Father, will be able to do so again in peace, continuing the reconciling mission of Jesus. to your feed and I hoe you write again soon!